A group of 28 students and 3 teachers enjoyed eight days in New Caledonia at the end of Term 3. New Caledonia, only a short 4 hour flight from Melbourne, is a French speaking island nation, known for its beaches and love of water sports. One highlight was the day spent on Amedee Island, a tiny islet a 45 minute boat ride from Noumea. The scenery was incredible. The students climbed the lighthouse for an incredible view, went on a glass bottom boat ride looking at the fish, turtles and coral. They even swam and snorkelled with turtles. There was a delicious buffet lunch and a show of traditional dancing and music. 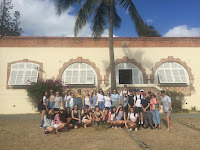 The trip was a great success and the students learnt a lot: about French language, about New Caledonian culture and history and about themselves as they stayed with a different family in a different country. Thank you to Ms Antal, Mr King and Ms Dickson for accompanying the group and ensuring the tour could go ahead. We look forward to travelling with next year's Year 9 students of French!